Preface. Ice-Structure Interfaces. Frozen soil-structure interfaces (B. Ladanyi). Experimental investigations of the behaviour of ice at the contact zone (G.W. Timco, R.M.W. Frederking). An ice-structure interaction model (D.S. Sodhi). Models of ice-structure contact for engineering applications (K. Riska). Soil-Structure Interfaces. Modelling and testing of interfaces (C.S. Desai, D.B. Rigby). Soil-structure interfaces: experimental aspects (M. Zaman, A. Alvappillai). Soil-structure interaction: FEM computations (M. Boulon, P. Garnica, P.A. Vermeer). Boundary element modelling of geomaterial interfaces (A.P.S. Selvadurai). Steel-Concrete Interfaces. Lattice model for analysing steel-concrete interface behaviour (J.G.M. van Mier, A. Vervuurt). Modelling of constitutive relationship of steel fiber-concrete interface (S.P. Shah, Z. Li, Y. Shao). Steel-concrete interfaces: experimental aspects (H.W. Reinhardt, G.L. Balázs). Steel-concrete interfaces: damage and plasticity computations (J.M. Reynouard, O. Merabet, J.L. Clément). Mechanics of Rock and Concrete Joints. Mechanics of rock joints: experimental aspects (L. Jing, O. Stephansson). Rock joints - BEM computations (G. Beer, B.A. Poulsen). Rock joints: theory, constitutive equations (M.E. Plesha). Rock joints: FEM implementation and applications (A. Gens, I. Carol, E.E. Alonso). Concrete joints (J.-M. Hohberg). Interfaces in Discrete Systems. Pore pressure effects on interface behaviour (R.O. Davis). Frictional contact in collections of rigid or deformable bodies: numerical simulation of geomaterials motions (M. Jean). Interface localisation in simple shear tests on a granular medium modelled as a Cosserat continuum (I. Vardoulakis, P. Unterreiner). Interfaces in particulate materials (A. Misra). Author index. Subject index. 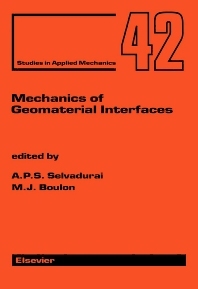 The subject of geomaterial interfaces recognizes the important influences of the interface behaviour on the performance of interfaces involving cementaceous materials such as concrete and steel, ice-structure interfaces, concrete-rock interfaces and interfaces encountered in soil reinforcement. During the past two decades, the subject of geomaterial interfaces has attracted the concerted attention of scientists and engineers both in geomechanics and applied mechanics. These efforts have been largely due to the observation that the conventional idealizations of the behaviour of interfaces between materials by frictionless contact, bonded contact, Coulomb friction or finite friction tend to omit many interesting and important influences of special relevance to geomaterials. The significant manner in which non-linear effects, dilatancy, contact degradation, hardening and softening, etc., can influence the behaviour of the interface is borne out by experimental evidence. As a result, in many instances, the response of the interface can be the governing criterion in the performance of a geomechanics problem. The primary objective of this volume is to provide a documentation of recent advances in the area of geomaterial interfaces. The volume consists of subject groupings which cover ice-structure, soil-structure and steel-concrete interfaces, mechanics of rock and concrete joints and interfaces in discrete systems.